Enter The Durham Museum and immediately you'll feel connected to another place in time. Housed in Omaha's historic Union Station, you'll find exhibits that explore our region's vibrant history as well as those spotlighting fascinating global topics. Climb aboard passenger trains from the 1940's and 50's, enjoy beautiful art deco architecture and visit the authentic Soda Fountain. 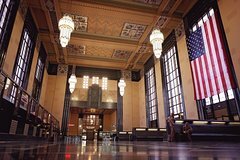 Union Pacific’s $3.5 million Union Station was designed by Gilbert Stanley Underwood as one of the nation’s first art deco train stations. The station opened in 1931 and was immediately heralded as an architectural gem. Union Station was at its peak during World War II, when more than 10,000 passengers passed through each day. Today, this rare jewel has been transformed from top to bottom into one of the nation’s most vibrant and beautiful hands-on museums. The museum is named in honor of Omaha philanthropists Margre and Charles Durham, who played an instrumental role in restoring the facility. In 2016, the building was declared a National Historic Landmark. The Durham Museum is proud to serve as a steward of our region’s heritage. The museum provides countless opportunities to discover Omaha’s history. After stepping back in time with the life-like sculptures and beautifully restored architecture of the Suzanne and Walter Scott Great Hall, visitors can explore our extensive permanent galleries, which brilliantly capture the remarkable history of our region.